This fortnight the theme at The Craft Barn's Quotes and Lyrics Challenge is to use CHANGE and/or TRUTH. Well as I soon as I saw that I had to do Changes by David Bowie.....and I now know the correct words. I always thought it was strange changes but obviously not!! Love the finish on the clock. I had this song in my head whilst I was creating my entry (but I didn't use it!). fabulous background, and great choice of song. Love your project, especially the rusty enamelled clock...must read up on that technique - this is the effect I was after with my frame on the Craft Barn challenge! Great colours and song choice clock looks fabulous. 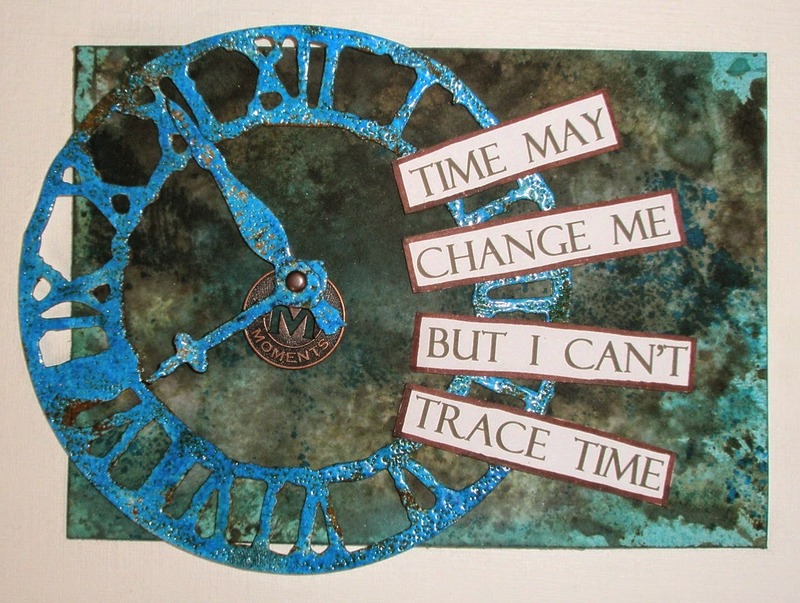 A great quote and a fabulous page - love the clock die. Great quote and a beautiful entry - love that blue! May be Simples but I love it :) Used the same quote as you did too - one of my favourite Bowie songs, great minds and all that! This is just fabulous. Another fabulous song choice Elaine, and a wonderful card. I have a thing for clocks and these lyrics were illustrated perfectly. I also liked your choice of colors.